SPAWNERS hosts walks by local naturalists and experts in native ecosystems, geology, land history, and more. We want to show you the natural beauty in your own backyard! Would you rather spend Black Friday exploring outdoors rather than shopping indoors? 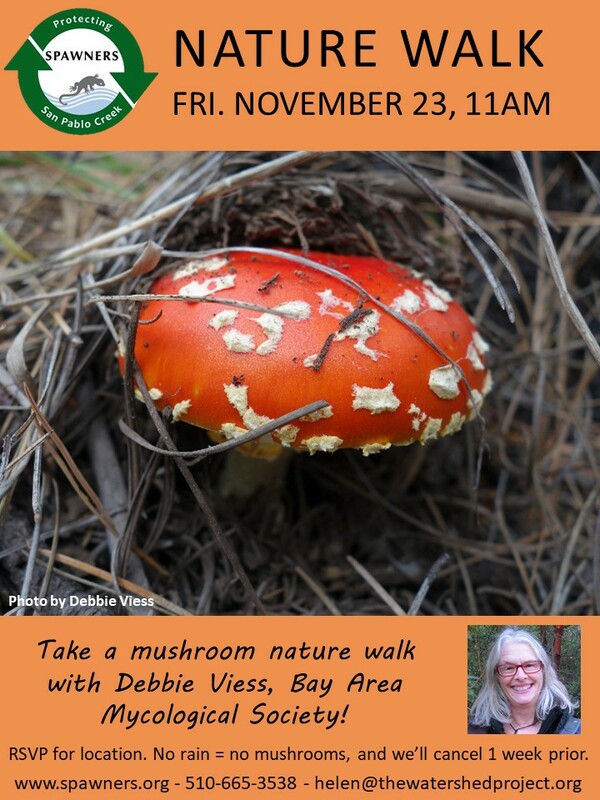 If so, join us for a mushroom-hunt nature walk led by Debbie Viess of the Bay Area Mycological Society! The location of the walk will depend on where we find mushrooms in the weeks prior to the event, so please RSVP to helen@thewatershedproject.org to let us know you’re interested in attending, and we will keep you updated. If we haven’t had sufficient rains to grow mushrooms by the week prior to the event, we will cancel.